Guillem Terribas. 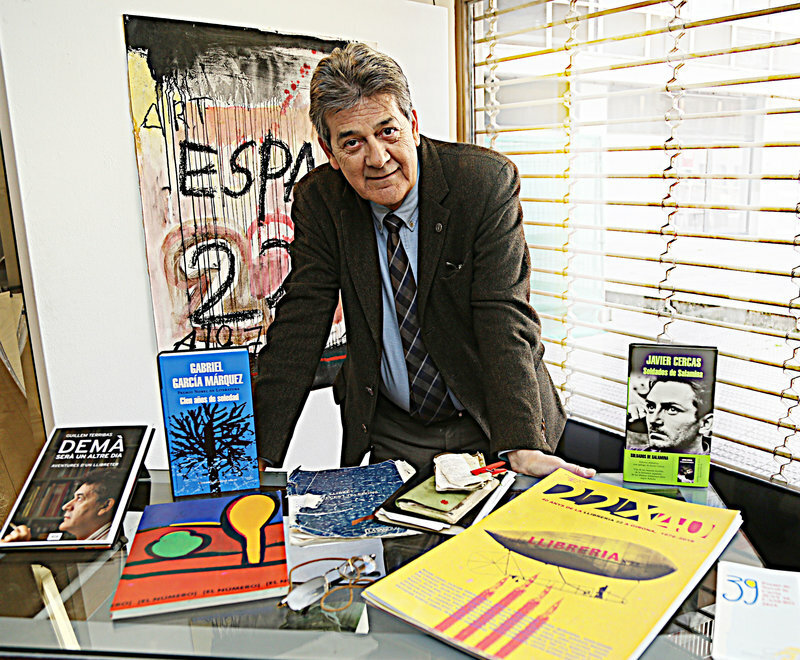 Founder of Llibreria 22 MANEL LLADÓ. Llibreria 22 is an institution in Girona and needs little introduction. Extremely active and highly influential, it celebrated 40 years last year, and we invited Guillem Terribas, owner and founder of the famous bookshop, to share with us his most highly-regarded books, and the essential elements in a life devoted to reading. 2. Soldados de Salamina, by Javier Cercas. I’ve known him since he was 17, presenting his books at La 22, but which passed unnoticed until he came out with Soldados de Salamina, and we knew it was going to be a massive success. During the shooting of the film I met David Trueba and Ariadna Gil, and I got involved in the film quite a lot. It’s a book that has meant a lot to me and the bookshop. 3. My book, Demà serà un altre dia. I didn’t plan to write a book about myself, but the publisher started from the idea of how could a bookshop not in Barcelona manage to bring together so many authors and have such a good reputation, and so become a phenomenon. I explain how this happened and, above all, I explain who Guillem is, which is the part of the story that people liked most, I think. 4. This booklet was to celebrate the bookshop’s 10th anniversary in 1988. I asked Narcís Comadira to make a book-magazine, with the collaboration of 22 authors. At the presentation, we had big names like Jaime Gil de Biedma, Montserrat Roig, Josep Maria Benet i Jornet, Nuria Pompeia, Josep Maria Fonalleras, Narcis Comadira, and others. Getting all of them together at La Mercè was spectacular. Xavier Folch asked who organised this, who is behind it, Guillem? Who managed to get all these people together? He couldn’t believe that I did it all by myself. From that moment, La 22 started to become a point of reference. 5. The magazine we published for the bookshop’s 40th anniversary. I asked 40 authors to write anything they wanted, and also asked authors to tell us about the books that impressed them most, and we published all the winners of the Just Manuel Casero award. 6. Glasses. I’ve always read a lot, and a time comes when you have difficulties reading without them. Thanks to them I’ve been able to continue reading . 7. The Premi Casero. Our jewel in the crown. It’s what has given us most satisfaction. I still can’t believe that 39 years later, we’re still doing it, discovering new authors. Mar Bosch, for instance, winner in 2012, now has an established career. 8. My agendas. I don’t use my phone agenda for events, I prefer paper. I used to have it all in my head, and would only write down the days of presentations and phone numbers. People have always been important to me, and I’m lucky to have a great agenda of phone numbers, and many still call me to ask for contacts.